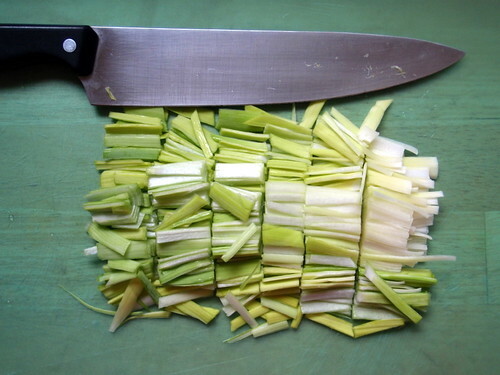 When I first saw this recipe on Bitten, I knew I had to make it the very next time I received leeks in my Boston Organics delivery. Finally, my patience paid off. 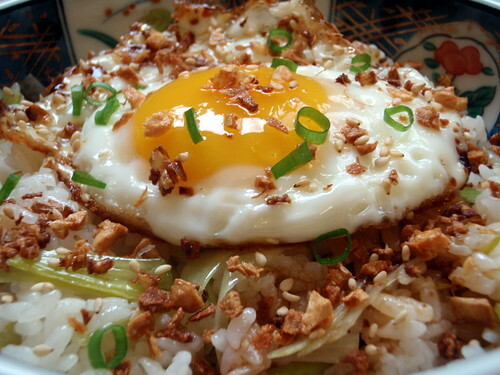 This fried rice recipe is familiar in some ways--using day old rice and eggs--but quite novel in others. 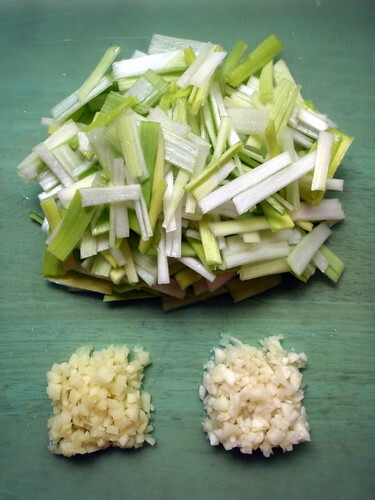 There are no vegetables other than the leeks or any chopped, leftover meat. Instead, minced fresh garlic and ginger are fried until crisp and then sprinkled on top to dress the rice along with a drizzling of sesame oil and soy sauce. In the article, Mark Bittman writes that Jean-Georges uses rendered chicken fat; since I had duck fat leftover from making the duck fat fries, I used that instead. Also, instead of using day-old cooked rice, I used rice that had been cooked a month ago and frozen in the freezer. Whenever I have leftover cooked rice, I always divide it into first-sized portions and wrap them in plastic wrap and stick them in the freezer when they're still warm. That way I can just heat it up in the microwave for a minute to thaw, and none of the moisture is lost. Of course, after sitting in the freezer for a whole month, some of the moisture is lost, which makes it perfect to use for fried rice. In a large skillet, heat 2 tablespoons duck fat over medium heat. Add garlic and ginger and cook, stirring occasionally, until crisp and brown. With a slotted spoon, transfer to paper towels and salt lightly. Reduce heat under skillet to medium-low and add 1 tablespoon duck fat and leeks. Cook about 10 minutes, stirring occasionally, until very tender but not browned. Season lightly with salt. Raise heat to medium and add rice. Cook, stirring well, until heated through. Season to taste with salt. In a nonstick skillet, fry eggs in remaining tablespoon of duck fat, sunny-side-up, until edges are set but yolk is still runny. Divide rice among two dishes. Top each with an egg and drizzle with 1/2 teaspoon sesame oil and 1 teaspoon soy sauce. Sprinkle crisped garlic and ginger over everything and serve. I added a sprinkle of toasted sesame seeds and chopped scallions on top as well just for a little more texture and color. I was a little scared that the ginger might be too strong for my liking, but it was a lot more mild after frying, and the crunch it delivers is a real highlight to the dish. This recipe is truly inspired. There are very few ingredients, but because each is an aromatic, and you keep using the same fat to cook the ginger, garlic, and leeks, you end up building a lot of flavor in the final dish. At the same time, I finally know what they mean on Top Chef when they talk about simple, clean food. Thank you, Jean-Georges and Mark, for sharing this recipe. Now I really want to go to one of Vongerichten's restaurants. Luckily, he's opened one in Boston, and it's also participating in Taste of the Nation Boston tomorrow! This looks awesome. Jean-Georges has written some of my most favorite cookbooks. He may be a fancy four-star chef, but his recipes are straightforward and full of gusty flavors. I love your pictures!!! And the fried rice looks scrumptious! Definitely let me know how Taste of the Nation is. I tried Market awhile ago for lunch and thought it was OK, but definitely try the NYC one - I think it's better! 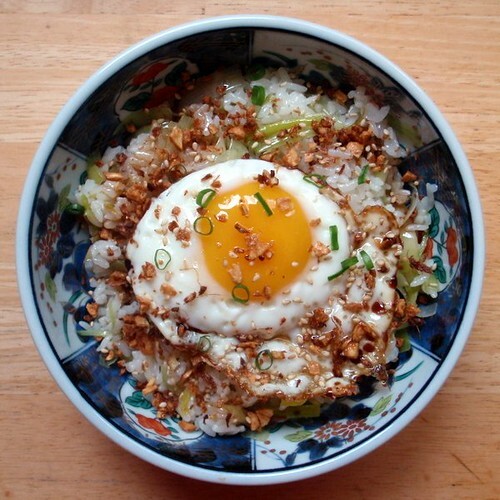 This is so different than fried rice as I know it. Now I'm curious about Jean-Georges' other reinterpretations. Looks yummy! It's always good to try something new. I like the pictures too. Thank you for posting this, I made it this evening... and it was delicious I can't describe how simple and clean the flavors are. If I would make one suggestion I would say make extra of the fried ginger and garlic, since you add it on to each portion you can always judge how much and still have some left just in case. I made it for dinner two nights ago and loved it! I think I may have left the garlic and ginger on for too long so it tasted very slightly burnt but other than that... delicious! I have never cooked with duck fat before and was very impressed by the aroma. Thank you fo rthe recipe!